Female travellers need to be prepared for any emergency, and carrying cover-ups that can be donned as needed is an important part of heading off any problems connected with your dress. When you are travelling abroad you’ll need to conform to local standards of women’s dressing and in some areas this means dressing much more modestly than you would in the United Kingdom. Even in countries where modest dressing is not typically required there may be times, such as when visiting religious sites, when you’ll want to cover more of your body then you would otherwise. To make sure that you’re dressed appropriately at all times, carry at least one emergency cover-up each day and research religious mores and local swimwear cover-ups so that you’ll fit in with the crowd instead of sticking out like a sore thumb. Or a tourist! When you pack your day bag it might seem like you’re carrying everything but the kitchen sink, but always make room for an emergency cover up. Cover-ups don’t need to be big and bulky, and in fact light and airy fabrics are often preferable anyway. Carefully fold up a small sarong, shawl or scarf and you’ll have a cover-up that can cover your legs, arms and head at a moment’s notice. 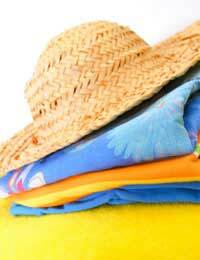 If you think you may need to cover your head, slip in a scarf or small hat that you can crush without hurting it. In sunny or rainy climates you may also want to wear a head cover anyway, so these items won’t add any weight to your pack. Cardigans and shrugs can also function as emergency cover-ups and you may be able to fold these items over a handbag or tie them around your shoulders or waist so that you don’t have to carry them either. Different religions hold different dictates when it comes to women’s dress. For example, among other things many Islamic women cover their head for religious reasons, many Mormon women do not go around with bare shoulders and Orthodox Jewish women wear long sleeves and long skirts. Even if you are not travelling in highly religious areas, you may want to go into religious sites which require specific modesty rules for women. For example, some Catholic churches prefer that women wear sleeves when inside, and visiting mosques, temples and synagogues may require similar covers for women’s hair or limbs. If at all possible try to wear clothes that cover a good portion of your body if you know you will be travelling to such areas or sites (lower hemlines, capris instead of shorts, higher necklines, short sleeves instead of sleeveless, etc.) and then simply don a shawl or sarong as needed to cover the rest. It’s not usually possible to cover the majority of your body when you’re going swimming, but in some Muslim nations this may well be required. Always research swimwear costumes for women before travelling abroad and remember that wetsuits may be an option for covering more of your body. However, if you are planning to stay only in tourist areas then it may be worth contacting your accommodation to see what will be expected of female tourists as opposed to local women. Long towels and sarongs will help keep you covered when you are not in the water, and light coloured t-shirts can be important to wear anyway, to avoid sunburn. The thought of having to carry potential cover-ups may make some female travellers uncomfortable, but smart women travellers will recognise that a light sarong may make all the difference between blending in and showing respect and sticking out and being viewed as disrespectful. Simply throw a sarong, shawl or scarf in your day bag and you’ll be ready for almost any modesty emergency that might arise.